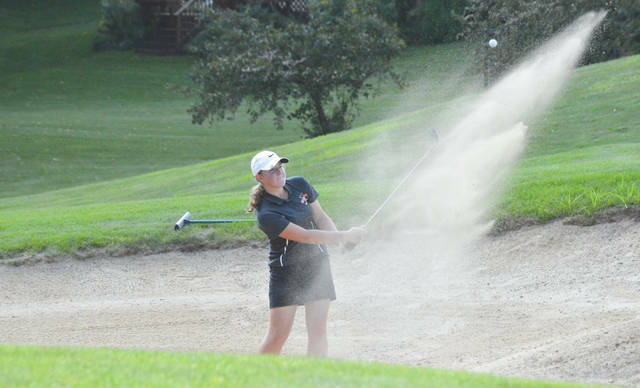 Beavercreek junior Sarah O’Connor blasts out of a sand trap during Wednesday’s Aug. 29 girls high school golf team match against Butler on the Beavercreek Golf Club’s front nine. Beavercreek senior Reagan Johnson hits an iron shot down the fairway, Aug. 29 at the Beavercreek Golf Club. While teammates Megan Diltz and Zoe Romaker grab their clubs for their tee shots, Beavercreek’s Ally Barnett hits a drive off a Par-3 hole Wednesday Aug. 29 during a Greater Western Ohio Conference girls high school match with Vandalia Butler at Beavercreek Golf Club. Beavercreek’s Sarah O’Connor lines up a putt. 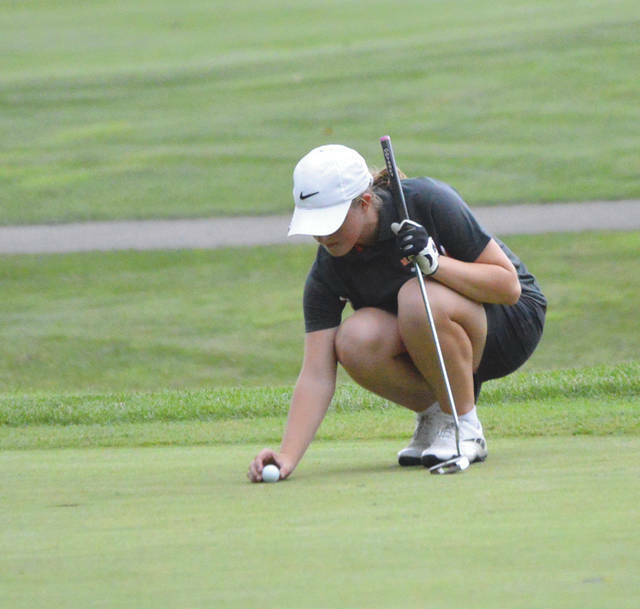 O’Connor scored a round of 40 to claim medalist honors in Wednesday’s 200-204 win over visiting Vandalia Butler on the Beavercreek Golf Club’s front nine. 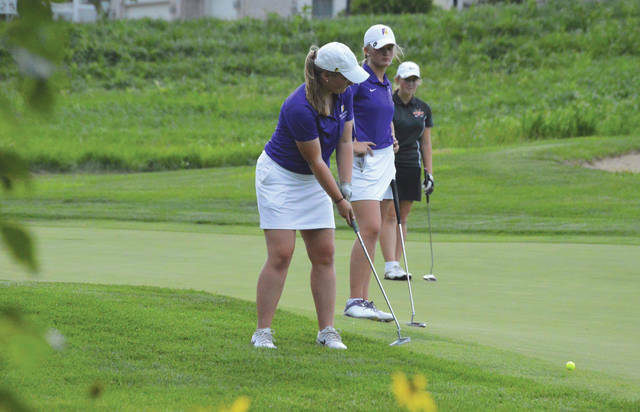 Butler’s Allison Zebney putts from off the fringe of the green, as Aviators teammate Lexi Crawford and Beavercreek’s Sarah O’Connor look on, Aug. 29 at Beavercreek Golf Club. 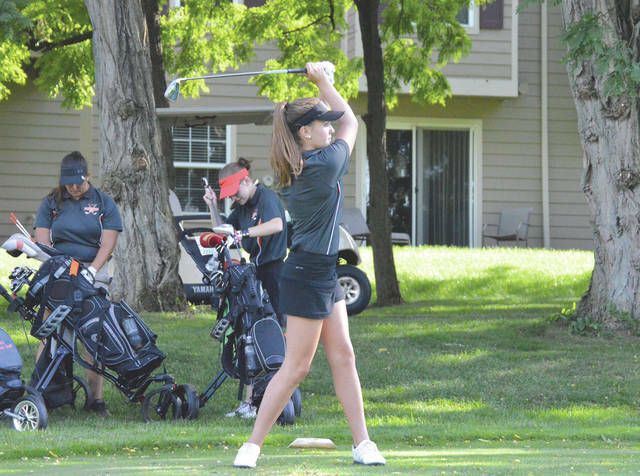 BEAVERCREEK — Despite gusting winds, hot temperatures and the constant threat of rain, the Beavercreek High School girls varsity golf team managed a 200-204 win over visiting Butler, Aug. 29 at the Beavercreek Golf Club. Playing on the par-36, 3,520-yard front nine, Beavercreek junior Sarah O’Connor led the way with a medalist round of 4-over-par 40. Butler’s Lexi Crawford drained at least four lengthy putts from the 12-15-foot range throughout her round to place second overall with a 49. Six Beavers golfers competed in Wednesday’s Greater Western Ohio Conference crossover match. O’Connor was the lone Beavercreek golfer in the 40s. Senior Reagan Johnson shot a 52, senior Jennifer Meek and junior Ally Barnett each finished at 54, and sophomores Zoe Romaker and Megan Diltz finished at 60 and 62 respectively. 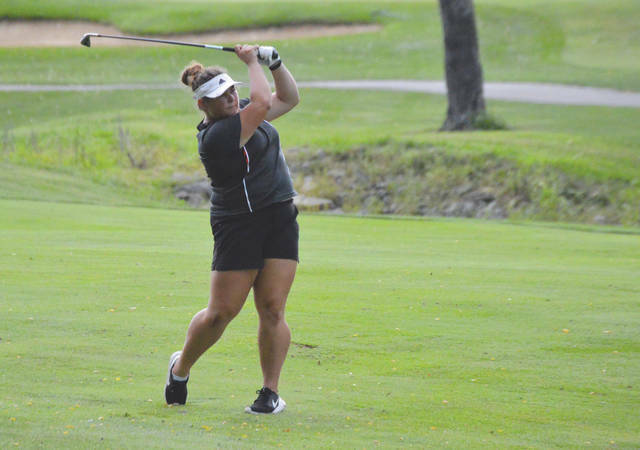 O’Connor, Meek, Barnett and Johnson teamed with graduated senior Hannah Purdin to become the first Beavercreek girls varsity golf team to qualify for the district tournament last season. Perry, Kroeker anjd Crawford were on Butler’s sectional team that placed 11th. Without strong winds and the heat, Beavercreek Golf Club is still a challenge for most golfers. The course is spread out over very hilly terrain, making it a challenge for the golfers. In a typical high school competition, the golfers themselves would walk the entire course. But in order to speed up the round of play, the golfers were picked up on golf carts and escorted from green to tee on a few of the areas where a longer (and hillier) walk was required between holes. Pryor made sure to compliment Butler coach James Perry on his team’s apparent improvement over last season. After finishing the 2017 season at 4-9 overall, the Aviators have already won as many matches in 2018. Butler had a number of golfers missing for Wednesday’s match, but still finished just four strokes from Beavercreek with only four golfers on hand for varsity action. Butler’s Hailee Perry and Allison Zebney were the only varsity golfers for either team to score under her season average. Perry finished with a 50, Bre Kroeker finished with a 52, and Zebney was just under her 53.10 average with a 53. The Aviators already have four wins this season. They’re now 4-3 on the year, and will have a slight break before they play Monday, Sept. 10 at Miamisburg next, a 3:45 p.m. match on the Mound Golf Course. Beavercreek (3-1) gets back in action at 4:30 p.m. Tuesday, Sept. 4. That’s when the Beavers will play a road match at Tipp City’s Cassel Hills golf course against Tippecanoe.